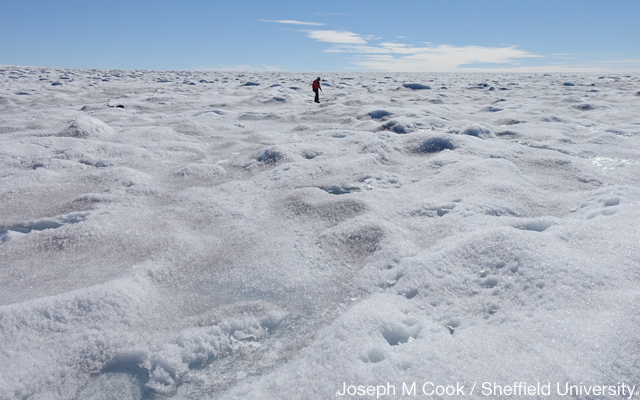 Excellent article pointing out that the effects of rain on the Greenland ice sheets. Not only is it odd — but it’s also accelerating the melting process. Among other things, the rain is producing crevasses and other new surfaces that can erode, evaporate, and melt. Scientists say they’re “surprised” to discover rain falling even during the long Arctic winter. The massive Greenland ice-sheet is being watched closely because it holds a huge store of frozen water. And if all of that ice melted, the sea level would rise by seven metres, threatening coastal population centres around the world. Precipitation usually falls as snow in winter – rather than as rain – which can balance out any melting of the ice in the summer. The scientists studied satellite pictures of the ice-sheet which reveal the areas where melting is taking place. And they combined those images with data gathered from 20 automated weather stations that recorded when rainfall occurred. On more than 300 occasions between 1979-2012, the analysis found that rainfall events were triggering a melting of the ice. Most of these were in summertime, when the air often gets above zero. But a growing number happened in winter months when the permanent dark of the polar winter would be expected to keep temperatures well below freezing. 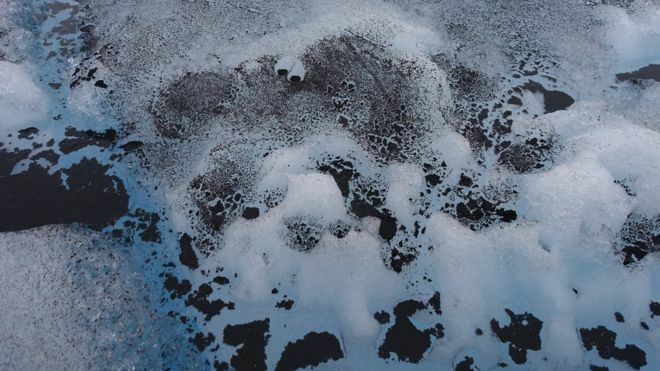 The lead author of the study, Dr Marilena Oltmanns of the GEOMAR ocean research centre in Germany, told BBC News: “We were surprised that there was rain in the winter. Even if it falls during winter, and then quickly refreezes, the rain changes the characteristics of the surface, leaving it smoother and darker, and “pre-conditioned” to melt more rapidly when summer arrives. “This opens a door to a world that is extremely important to explore,” Prof Tedesco said. 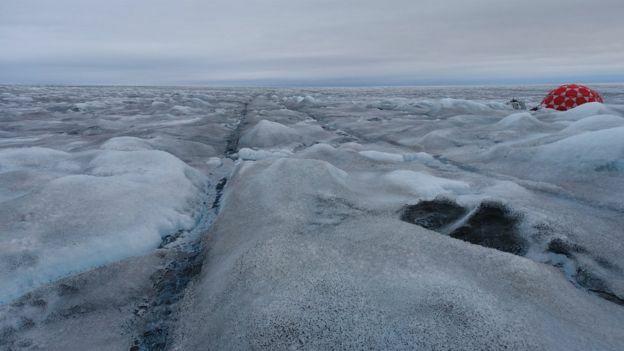 A smoother surface, particularly a “lens” of ice, will allow meltwater to flow over it much faster and being darker means that more of the Sun’s rays are absorbed, further speeding-up the warming process. 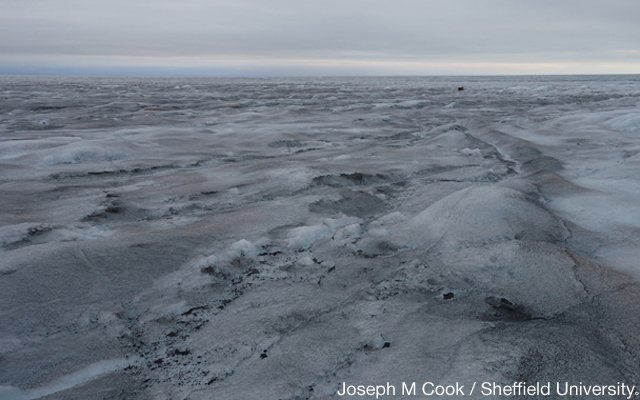 Pictures taken by a British research team, caught in a rainstorm on the ice-sheet last year, show how a bright highly reflective landscape of snow and ice was turned into a much darker scene. Although Greenland is extremely remote, a vast island lying at the northern end of the Atlantic Ocean, the sheer volume of ice covering it means its fate could have global repercussions. Although this contributes only a relatively small amount to the rise in the sea-level – with much of the rest coming from thermal expansion as the oceans warm – the fear is that the flow of meltwater could accelerate as temperatures rise. 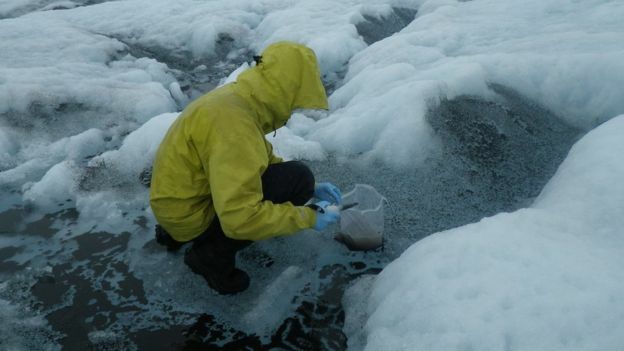 Two years ago, the BBC reported from Greenland on the risks of faster melting, because of the growth of algae which makes the ice darker and more likely to warm. This effect of algae is, in addition to darkening, caused by soot and other forms of pollution carried by winds to the Arctic. This comes amid growing concern that the region as a whole is warming twice as fast as the rest of the planet, which may be influencing the flow of the high-altitude jet stream. That could disturb weather patterns in Europe and other regions, and may also explain how the flows of warm, moist air from the Atlantic are reaching Greenland, even in winter. What do other scientists make of this? Prof Jason Box, a glaciologist not involved in the new study, says the research builds on earlier work by him and colleagues published in 2015 that found that summer rainfall could increase the rate of melting. Their analysis found that because water has a high heat content, it takes only 14mm of rain to melt 15cm of snow, even if that snow is at a temperature of minus 15C. “There’s a simple threshold, the melting point, and when the temperature goes above that you get rain instead of snow,” he said. Prof Box has himself experienced sudden rainstorms while camped on the ice-sheet. “After weeks of sunshine, it started raining on us and it completely transformed the surface – it got darker.